I was aware that I was a transgender person long before there was the internet, AOL chat rooms and blogs. I seriously thought I had to be the only person on this planet with this mind set. In 1962 I read about one other person and this allowed me some solace. Finally I found magazines that addressed my interest and I devoured every word. Many published irregularly and were difficult to find. These were baby steps to understanding and accepting myself. In these publications there was one name I found regularly and she quickly became my hero. The person, Kay Gould. As a person who travels about 150-200 days a year, I have been fortunate enough to visit most of the areas in which the cross dressing (CD) and transsexual (TS) culture exists. In fact, I always try to structure my personal schedule to be in as many cities as possible where events are taking place. Kay placed tasteful personal ads in these publications where she stated she was "Attractive, outgoing and loves to date. 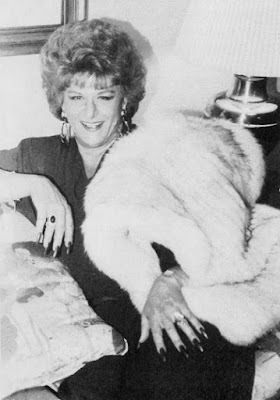 Kay said she was very accomplished, and frequently travels dressed; enjoys high fashion, good music, and friends." From the photographs, her self description was correct and write/travel Kay did. I was impressed with her numerous stories of dinners out, visiting places as Kay and travels. There were beautiful details. How could anyone be so brave? How could anyone be so forthright? Could I ever do something like that? How I envied her style. There would be nights I would fantasize and dream about doing the things Kay was doing. Much of the courage that I have today came from reading Kay's adventures. Courageous pioneers like Kay are needed. They make the impossible seem possible. They challenge all of us to know that our prisons are self-made and escape is not just possible, necessary. Kay, if you are still out there somewhere or anyone knows more details on Kay's life please comment. Also if anyone has any of the older publication with "Kay's Way" stories please scan and send. I would love to publish these again. Still relevant - Courage and fun never goes out of date. Thank you Kay for blazing a trail for all of us and helping us see that Escapes are possible. A gender escape pioneer.